You are here: Home > Cars for Christmas Mega Lottery Early bird deadline is fast approaching – don’t wait! $15,000 just in time for Christmas! Published on November 27, 2018 at 11:00 pm . Grande Prairie, AB, November 28, 2018 — Want to win $15,000 just in time for Christmas? Don’t miss the Early Bird #2 deadline of December 3. Buy your tickets today, and you will be entered to win $15,000 CASH – just for buying early! Tickets are only 1 for $50, 3 for $100, and new for 2018 – 8 for $200! 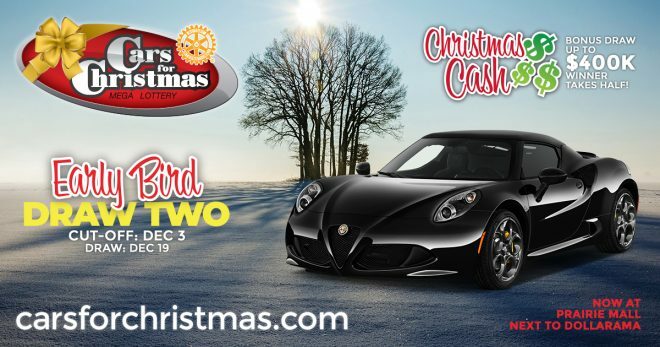 Your ticket will also be entered for a chance to win 92 prizes valued at over $469,000, including the Grand Prize 2018 Alfa Romeo 4C Spider Convertible PLUS $3,000 in Co-op Petroleum gift cards. Don’t forget your Christmas Cash Bonus Draw tickets – winner will take home up to $200,000 CASH. Click here to check out the current jackpot! The Swan City Rotary Club is proud to have given back over the past 18 years. 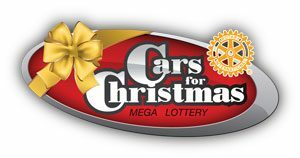 This year, proceeds from the Cars for Christmas Mega Lottery with help fund and support 8 local non-profit community groups. These 8 non-profit groups are very important to us. To learn more about them please visit here.